(Justin Gardner) A former “chief propagandist” for the Drug Enforcement Agency (DEA), now turned cannabis advocate, made startling comments at the recent Marijuana for Medical Professionals Conference in Denver, Colorado. 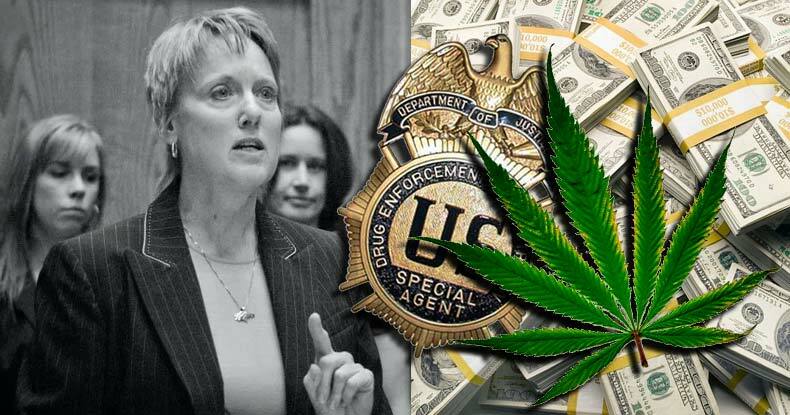 There, Belita Nelson described what many of us suspected – the DEA is corrupt to the bone and full of lies. “Marijuana is safe, we know it is safe. It’s our cash cow and we will never give up,” Nelson said to the audience of doctors and nurses, describing the modus operandi of the DEA. It didn’t take long for Nelson to realize cannabis has medical benefits. In 2000, she was watching her close friend suffer from late-stage cancer, losing more than 50% of his weight and no longer being able to eat or sleep. Being aware of cannabis’ ability to treat these symptoms, Nelson procured some for her friend, who, along with a better diet, was able to live nine more years. Nelson even grew the cannabis herself, knowing black market products were potentially unsafe. Sure enough, Nelson turned her passion into something positive. She moved to Colorado and began advocating for medical cannabis. In 2014, she focused her energy on using cannabis to help treat CTE and other traumatic brain injuries, setting up a holistic clinic with former Denver Broncos player Rick Upchurch. The DEA refused to reschedule cannabis from a Schedule 1 drug in 2016 when it had the opportunity, somehow concluding that ‘more research is needed’ to show cannabis has medical benefits. The only explanation for maintaining the absurd Sch. 1 classification for this miraculous healing plant is to protect Big Pharma, which knows cannabis is a threat to their profits. The DEA is the biggest obstacle to freedom and health options. It is abundantly clear that corruption and lies – not the interest of the American people – is what drives this agency to continue its tyranny. Edit, 1/29/17: Nelson was interviewed by The Hemp Connoisseur Magazine in 2013, where she explained how she caught the attention of DEA in 1998. Nelson’s son was fighting heroin addiction, and she had set up a non-profit organization to help addicts get treatment, while speaking out against drugs. The $10,000 DEA offer in 2004 was part of an effort to turn Nelson into a confidential informant — against those she was helping with her non-profit. “In 2004, the agency came to her with a proposal: give agents useful information gained from patients in her drug treatment program, and they would pay her $10,000 a month. It was an offer that she would refuse on ethical, as well as legal, grounds. Doing so would prove to be absolutely disastrous to her career.